My sister-in-law gave me a beautiful book called, ‘Falling Cloudberries’, by Tessa Kiros and this was one of the first recipes I flipped to. There are a bunch of ways you could play with this, but we enjoyed it straight up over brown rice – enjoy! 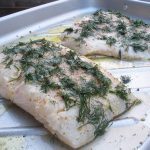 Preheat the oven to 350 and put the fish in an appropriately-sized casserole where it will fit in a single layer and sprinkle all with salt and freshly ground pepper. In a separate bowl, mix together the tomatoes, parsley, garlic, lemon juice, celery, sugar and olive oil and then give the mix a taste for seasonings. 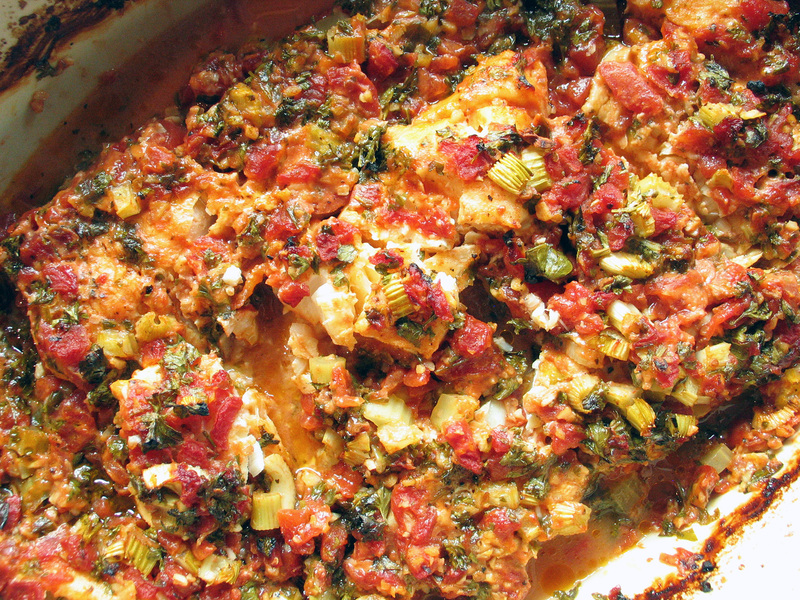 Pour the tomato mix evenly over the prepped fish, cover the casserole with foil and bake for 30 minutes. Remove the foil, turn the heat up to 400 and bake for another 45 minutes or so until the liquid has thickened slightly and some bits of the fish are crispy in places. Serve straight away with something that will assist you in soaking up the marvelous sauce.